Since the city is the country’s capital, there are really rich offers in cultural events during the summer and especially in August. Edinburgh International Festival is part of the most important summer events in Scotland and whole United Kingdom. Founded after WWII, it’s inviting artists and audience to a world class festival, and over the year it has become a major Scottish capital’s cultural and social event. 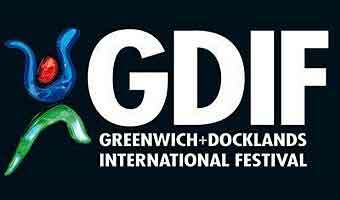 This is the event where you can find dance, film, music, opera, talks & workshops and theatre at 17 different venues. You can make a choice to visit King’s Theatre, The Hub, Usher Hall, The Queen’s Hall or let’s say Edinburgh College of Art. 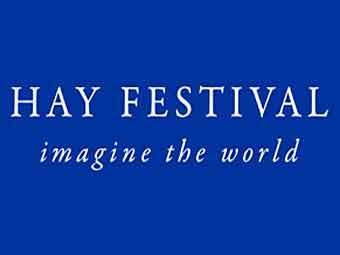 The festival starts with a great opening ceremony, followed by the Hebrides Ensemble, the day after, that will take place in the Queen’s Hall. The event ends on one of the the last days of August, with spectacular closure – The Virgin Fireworks Concert – that will perform Debussy’s Ecossaise or Wagner’s Ride of the Valkyries. 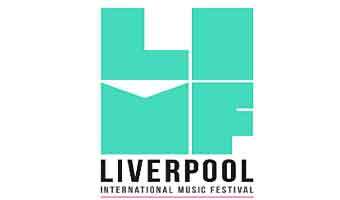 With an aim to really make a festival for all, there are also facilities for deaf and hearing impaired and visually impaired people. In recent years Edinburgh has become famous for its New Years Eve fireworks displays. Hundreds of thousand spectators crowd into Princes Street to watch the display from the castle. The celebration is a three days long party of spectacular events. Bands, Shetland Vikings, choral singing in St Giles’ Cathedral, Scottish music in the Old Town, and the great fireworks at NYE. 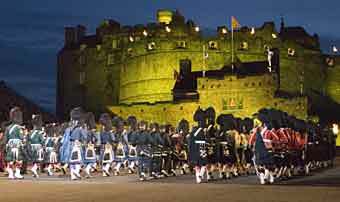 During August the Edinburgh Tattoo is held, featuring military displays, music and marching from around the world. The performances have been running since 1950 and attract daily audiences of over 8,000 people. Performances of the tattoo are every weekday evening and with 2 performances on a Saturday. 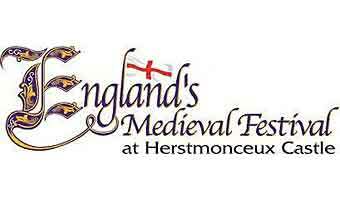 The backdrop of the floodlit castle has made this a world famous event with 30 countries having broadcast the performances on TV. One of the worlds largest arts festival with thousands of performers at hundreds of stages in Edinburgh. 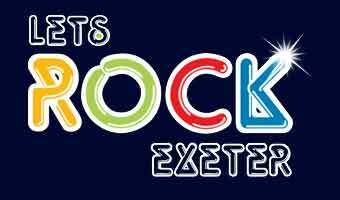 Shows for any taste from well-known artists to unknown names in the entertainment industry. Edinburgh Mela is Scotland’s biggest celebration of world music and dance. A great culture festival with both national and international artists. 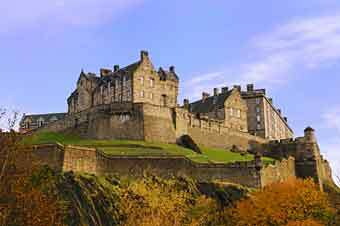 Dominating the skyline is Edinburgh Castle, built on the top of Castle Rock, an Iron Age settlement. The Castle is Scotland’s most visited paid tourist attraction with over 1.2 million visitors per year. It contains Edinburgh’s oldest building in the 12th century St. Margaret’s chapel. From the 17th century it was mainly used as an army garrison and the British Army is still responsible for many parts. 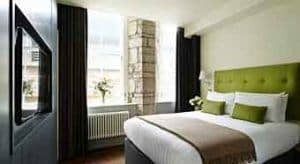 On the south side of the castle running east is the Royal Mile, the main street of the old town, which runs from the castle to Holyrood Palace, the official Scottish residence of the British monarchy, and open daily from 09.30. When you leave the Royal Mile you travel through the esplanade of the castle, now a major tourist attraction in itself, before you are met with the kilted soldiers of Scottish regiments. The castle is open daily from 09.30 am. Closing time varies seasonally. During the day the retail outlets of Princes Street provide top quality shopping. You may wish to visit the Kilt stores where you can investigate if you have a clan tartan, or visit the many cafes, restaurants and bistros in the area, where in summertime you find street entertainers providing music, poetry or short drama. There are many other attractions to visit including the Royal Scottish Academy and the National Gallery of Scotland, both situated beside the Princes Street gardens. Edinburgh Zoo lies to the west of the city centre. Well known for the only giant pandas in the UK. 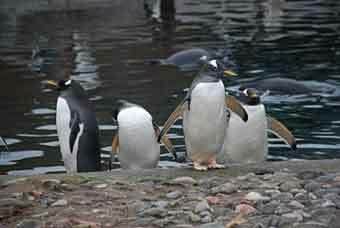 There is also here a large penguin enclosure where the penguins come out of their enclosure at 14.15 daily for their walk through the visitors. It is a short journey of 14 kilometres from the city to the two most famous of bridges in Scotland. The Forth Rail and Road bridges which have viewing platforms. 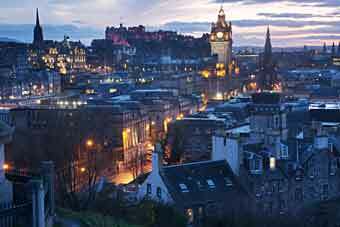 Edinburgh is the Scottish capital city, well connected with cities from Europe and from cities around the globe as well. Its international airport lies 12 km to the west. 2 railway stations in the centre, with the main station, Waverley, located on Princes Street, being on the East Coast route from London. Frequent train lines from London, Manchester and many other cities. A good thing is that they are more common during the summer months. There is a good network of motorways leading to the city, but parking space is very limited in the centre. It is advised to buy a Day Bus Pass if you want to do a lot of journeys, but there is also an excellent taxi service with the black cabs showing an orange light when available for hire. Most tour agencies suggest walking the city, as with its charming and amazing architecture, it’s really perfect for it.